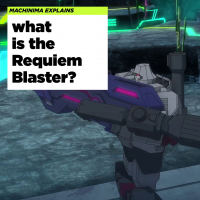 Home » Generations / Classics » Machinima’s Power Of The Primes Video: What Is The Requiem Blaster? Machinima’s Power Of The Primes Video: What Is The Requiem Blaster? 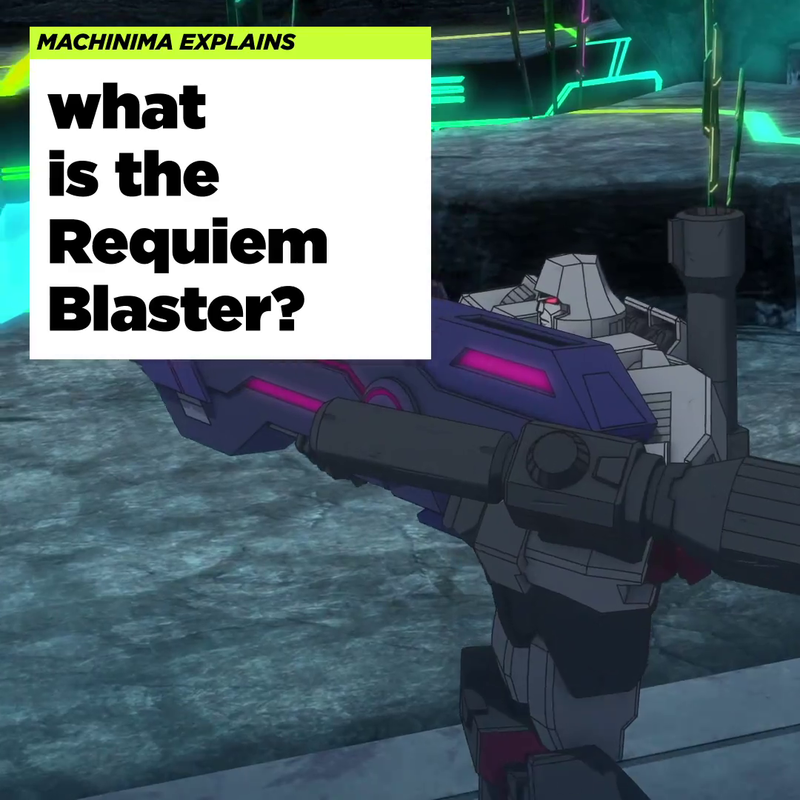 Machinima’s Facebook have uploaded an interesting video named “What Is The Requiem Blaster?” where they present and explain details about this weapon for the Power Of The Primes continuity. If you are watching the new “Power Of The Primes” series, we are sure you will enjoy not only the background story of the Requiem Blaster, but some cool scenes like Megatron holding the ancient and powerful weapon. We also catch a glimpse of the mysterious guardian of the Requiem Blaster. You can watch the mirrored video below, and then sound off on the 2005 Boards! What is the Requiem Blaster? Seriously though, with all this G1 focus, they would at least try to handle the source material better. It's like "Hey, there's these three weapons that consist of three little robots each. What should we do with them?" "Ehhh… just slap their names in some weapons and make them mcguffins." The best developed character on the show is a … a gun. Do not you think that this particular Megatronus is very much like Thanos from the recent film of the Infinity War? OH SH*T- THANOS AND THE FIRE LORD HAVE FUSED!! I've said this a few times, and the perspective certainly allows me to enjoy the series more. This mini-web series should be understood just as we do getting a bonus comic book with a Deluxe figure. Often there's little in the way of real attachment to any continuity, the stories are short, not the best quality, and crammed with characters that don't make the most sense interacting (recall the horrific Universe comics that, coincidentally, also threw in Optimus Primal in the mix). This token mini-series should not be compared with past, full-length animation projects. And just my opinion, but although the Unicron trilogy was generally not so great, Armada alone does stand out and is significantly better written than this, even if it can't compare to its style predecessors like Masterforce or Victory in terms of animation. I'll take average cel robot animation any day over average and stiff robot CG. I thought it was made up of 3 little dudes. What is the Requiem Blaster? The combined form of the Space Minicon Team. SLAG! Beat me to it! Without checking the video, let me guess – the writers just browsed TF wiki and found the name there, they don't actually know it is a weapon composed of 3 Minicons, right? Actually, that sort of explains it, no? Megas was the show where every time lore or plot or something interesting started to happen, that fat guy accidentally pushed a button and blew up half a planet or something. I mean the whole show could have ended with a truce between humans and the aliens but he messed up and by mistake punched the leader and started it all again. There was also the episode with Peter Cullen and Frank Welker voicing expies of Prime and Megs that ended with Not-Cybertron blown up. Maybe they are doing these shows as parody too, and Hasbro still does not realize that? We DID get figures of them. And they are basically Titan Master sized blocks that turn into the inner robots of various G1 pretenders, so… nothing special. Also, why doesn't Megatron just slap it on his arm replacing his fusion cannon? They cannot even alter their CGI models by that much? The requiem blaster (and the star saber) haven’t been made of minicons since the 13 were fully established. Short video with details about the Requiem Blaster for this continuity. We see Megatron with the Requiem Blaster. I found the actual name of this Trilogy series in one of the writer's desk on crumpled paper. This is one of the worst transformers series of all time. I can't even believe there are people defending this stuff. We really shouldn't be shocked since the bayverse is somewhat popular with fans. Remember when they made a human transformers "chain" to get an item to a helicoptor from a building. Let's just be happy the toy line has been one of the best ever and just take what we can get animation wise. Isn't animated coming back? I mean is there any hope for a good series on our horizon? The worst part is this is series 3 from machinima and the fandom has been giving them valid criticisms everywhere you could look, yet here we are. "What is the Requiem blaster?" A high tech laser cannon being "forged" by a god (or a Prime) just sounds stupid. I know its science fiction and all, but cmon really? I like it too. I just don't understand what's the big deal it's a free online cartoon! I mean it's FREE, you don't have to pay for it. They give us a free cartoon to watch, for our enjoyment and everybody just complains about it. And I mean come on does anyone remember the Unicron Triogy cartoons? Those were horrible cartoons, this is way better in every way. This 7 minutes of Armada is better than EVERY single episode of this travesty of a series put together. This 7 minutes of Armada is better than ALL of the episodes of this travesty of a series combined. ALL TRANSFORMERS CARTOONS SINCE G1 HAVE BEEN "FREE." Didn't know the show was that good. I mean, wow. Your statement is on par with the quality of this travesty of a cartoon. wow, pretty cool how instead of explaining this in the show they just make an expositional clip. truly revolutionary. Actually, it's pretty honest and respectful to the audience that even trailers for this series show how inept are creators with doing cinematography. This way I can know in advance to not bother. I'll do them one better, why is the requiem blaster? Don't be so harsh for the creators. Chances are they'd have difficulties answering why is anything in their series plots. Have mercy for the creatively impaired. When is this coming to season dvd sets? CW was part of Target's special edition of TLK.